Historic Seattle breathed new life into the 108-year-old building. As so many of the low-rise, century-old buildings in Seattle’s core meet their inevitable end with the wrecking ball and are replaced with taller, shinier and sharper-edged structures, some of the city’s history is swept away with the dust and discarded rubble. But at least one building that has been a part of many Seattleites’ memories is escaping this fate. 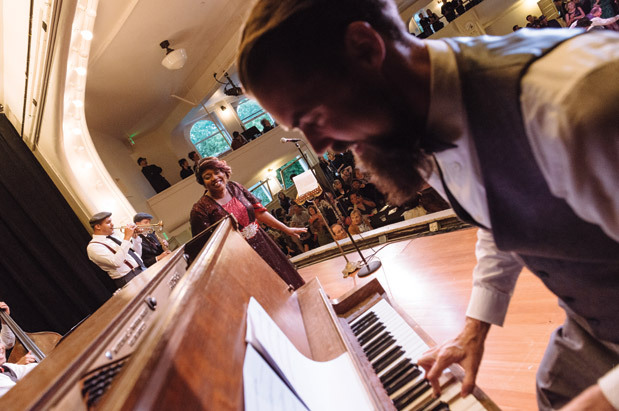 June saw the opening of the newly restored Washington Hall, a venue that has been the location of many a great night out, and has played an important role in building community and Seattle’s music scene. The three-story Mission Revival building, located a block from the rapidly changing corner of 14th and Yesler in the Central District, was given its reprieve by the community-based organization Historic Seattle, which purchased the building in 2009. The group’s seven-year, $10 million campaign has restored, upgraded and breathed new life into the 108-year-old building, which started out as a Danish Brotherhood in America fraternal lodge. Known to many Seattleites as the former home of the performing arts organization On the Boards, its primary tenant from 1978 to 1998, Washington Hall is the place where many Seattleites who came of age during those years were introduced to contemporary avant-garde dance and performances from around the globe. It was also the center of the local dance scene, where Seattle-born Mark Morris introduced his choreography to the world, and Pat Graney defined the city’s dance aesthetic for years to come. In subsequent years, its stage hosted such acts as Elvis Costello, David Byrne and Seattle’s own Macklemore. But long before that, it was an important venue where some of the greatest American musicians performed. Marian Anderson, Mahalia Jackson, Billie Holiday, Duke Ellington and Count Basie all graced its stage. There is a famous photo taken there in the mid-’60s showing a white-tuxedoed Jimi Hendrix playing what is reportedly his first gig. It was also the place where W.E.B. Du Bois, Marcus Garvey and Joe Louis spoke during their Seattle visits, at a time when many venues were closed to people of color. The building has also served the needs of the city’s many ethnic and cultural communities since members of the Danish Brotherhood first provided a dance hall and lodgings for their fellow immigrants. It has been an affordable rental facility and activity center for members of the Jewish, Filipino, African-American, Korean, Eritrean and Ethiopian communities that have lived in the neighborhood. Historic Seattle, eager to keep the restored building functioning in its dual role as an arts and community center, has chosen three anchor partners to occupy and collectively manage its spaces and common areas: 206 Zulu, a nonprofit community group that uses hip-hop as a platform for youth engagement, education and empowerment; arts and culture collective Voices Rising, which produces an annual season of performances, workshops, art exhibitions and video/film screenings featuring Northwest LGBTQ artists of color; and Hidmo, a unique Eritrean culinary and community organization. Since its reopening, Washington Hall has hosted a variety of events that give a sense of what’s to come. On June 10, in conjunction with History Link (historylink.org), the online encyclopedia of Washington state history, Hidmo and 206 Zulu produced Jazz Intoxication. Directed by Tyrone Brown, with a script by Seattle playwright Rachel Atkins and music direction by Industrial Revelation’s D’Vonne Lewis, it was a theatrical and musical reenactment of the city’s first reported jazz performance, which took place at the hall 98 years ago to the day. The following week, 206 Zulu and partners presented Diaries of a MAD, a theatrical event based on 206 Zulu founder King Khazm’s experiences as a biracial, disabled youth in Seattle’s South End, which included hip-hop performances, visual projections and dance. For more information on programs and upcoming events at Washington Hall, click onto Historic Seattle (historicseattle.org), Hidmo (hidmo.org), 206 Zulu (206zulu.org) and Voices Rising (Facebook, “Voices Rising Northwest”).